I need a quick baby quilt that looks complicated! Thread: I need a quick baby quilt that looks complicated! I just received an invite to a baby shower that is only 5 days away. Can you recommend a pattern that is easy but looks like it took a lot of time? The fastest for me would be a rail fence in 3 or 4 coordinating fabrics. I would strip-piece sets, then cut into squares. 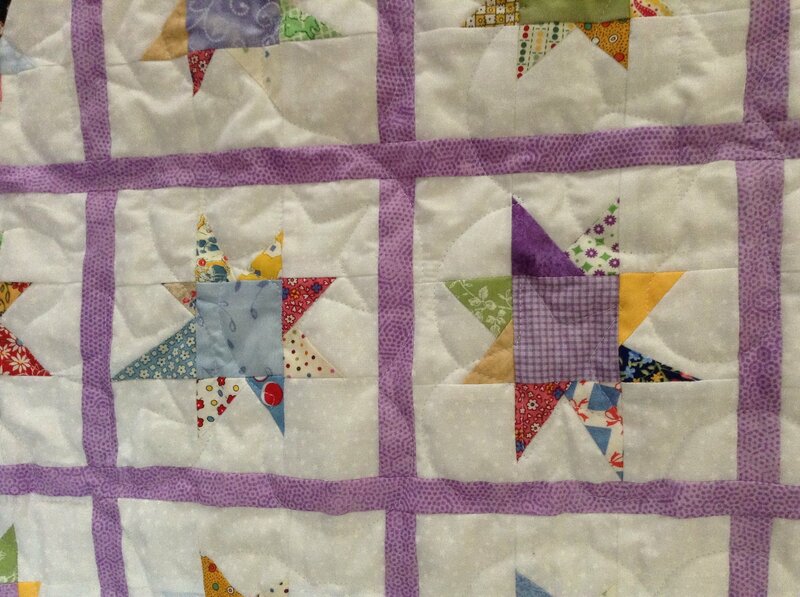 After piecing the center I might add a border (or 3) out of remaining fabrics. A DP9 would take me a little longer (have to create 9-patch blocks, cut them, then reassemble) but it looks complicated. Warm Wishes is another one that would take me a little longer, but it's really easy to do with a focus fabric and two solid colors. Wonky Stars! 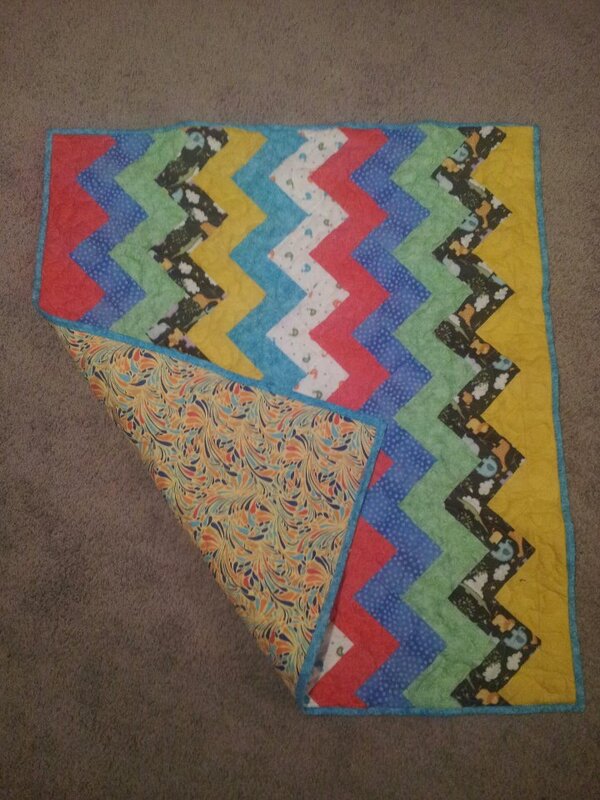 2 1/2" squares, lots of scraps!! This is maybe not what you had quite in mind - there are lots of gorgeous baby panels that look amazing with trapunto and some lovely borders. MSQC put up a pattern a bit ago called The Merry Go Round quilt. It looks kind of like the Garden Maze pattern but is really simple if you watch Jenny's youtube video. The classic "looks hard but is easy" is the D4P. But why does it need to look complicated? Simple can be really pretty too, just letting the fabrics have the spotlight. A simple 9 patch with prints alternated with white would be really sweet. Oh cute! I hadn't seen that one yet. Thanks for sharing it. I agree with PaperPrincess. This is fast, easy and looks great! Made the merry go round from MSQC easy and fast. They'd get a gift cert from me. Their failure to plan ahead does not constitute an emergency on my part. I'm pretty sure they knew more than 5 days in advance they were having a baby shower. Chevron made with strips, cut and placed on the diagonal. If you know the gender, it would be an easy quilt. I'd think Warm Wishes would be quicker than a rail fence, since half the blocks are just two focus fabrics of one fabric per square. Last edited by fallonquilter; 08-14-2013 at 04:04 AM. I just finished a disappearing four patch. Loved the results and much quicker that I thought it would be. I made 12" blocks (finished) and a 1.5 in inner border and a 3 inch outer border and diagonal quilting and some stitch in the ditch and send it off. I too just found out my niece , who has been trying to have a baby for 4 years is adopting a baby girl. I just saw this disappearing 16 patch on fav quilts a few minutes ago. http://www.favequilts.com/Block-Patt...VhKWfCWfZsX.32 . Hope the link works. I am debating between the 16 patch and the Merry go round and the 3 dudes pattern. I had just decided I was going to play in my sewing room all day today on another project. I guess my plans have changed. Why not something simple like a solid square (focus fabric) alternated with four patches (2 coordinating/contrasting fabrics). or snowballs alternating with a 9-patch. Melissa Corey says she is wife and mother to 5 kiddos by day and by night and naptime she is a happy quilter. I noticed her post on the disappearing 16 patch was sent at 5:?? AM. Or maybe it was an earlier time. I can relate!